Will they inspire you into a new weaving project? That's just a beautiful shot. Gorgeous. Thank you so much for your kind words in my blogg! Such lovely baskets you make, I have never seen any like them. You take lovely pictures as well. I love them all!!! What a gift to have a summerhouse in Norway! Your spring has come a little bit futher than ours but not so much. Soon our snow has melt and the springbulbs is here, oh how I long *smiles*. 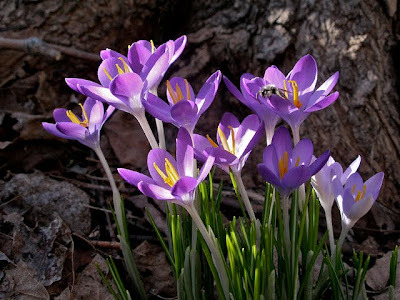 Today my first crocus bloom! Photos of the finished basket coming soon!